“O sancta simplicitas! In what strange simplification and falsification man lives!” So begins Nietzsche’s second chapter of “Beyond Good and Evil”. It says that humanity has always contrived to retain its ignorance, so that we might realise “an almost inconceivable freedom”. Indeed to Nietzsche even our thoughts were suspect. For those who call themselves ‘free spirits’ in a philosophical sense are in fact often “glib tongued and scribe-fingered slaves of the democratic taste and its ‘modern ideas’ […] they are not free”. Just a quick explanation here; note the use of “almost” in Nietzsche’s work. Contrary to what a lot of people think, Nietzsche did not oppose, or dismiss, freedom. To him it was something that we strive towards, but are simply very unlikely to really obtain. So there are contradictions. And it’s difficult to define in an objective sense. But even if we have different imaginations as to what it is; we definitely have at least the illusion of freedom/free will. But if nothing comes from nothing, how can we create an illusion of that which truly doesn’t exist? The illusion of freedom must either be an image of a conceptual reality, or at very least a modified version of a very similar concept; and if it is the second, it has since caused us to create the conceptual reality of freedom. So freedom does exist. But is it a real option in our lives? Or is it more as John Dewey said, that our activity results from impulses that emerge spontaneously in response to changes in circumstances? Let’s think. In most of the world escaping into the wild; where only nature would restrict our actions; simply isn’t an option. There isn’t enough wild to escape into, particularly in Europe. So, if we can’t hunt and forage for ourselves, we’re forced to live within those societies and economies which already exist. Within these societies we are forced to go to school throughout our childhood. And within these economies we are forced to either enter the labour market in order to earn enough to survive, or live off the benefits provided by those who feel themselves to be forced into the labour market. Freedom of entry into, and exit out of, the labour market, is not free. Society presents us with commitments that restrict our geographical location, creates expectations that further limit our options in the job market, and creates the economic demand which dictates what careers are going to pay. Flexible and part time roles aren’t allows offered, and thus to take a job we are usually forced to spend most of our time in the job. The competitive economy forces employers to work their employees hard enough that during their free time, many people are too tired to properly look after themselves by exercising or cooking healthy food. In order to stay alive we need a place to live, and to pay bills that often leave us with less than enough cash to freely pursue what we want during that limited amount of free time that we have. 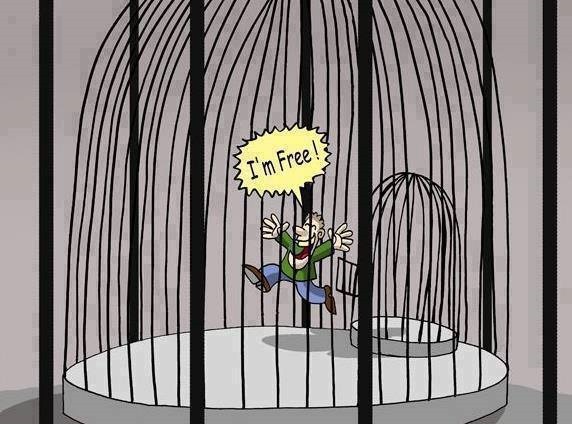 We are even imprisoned by society’s desires. Who reading this can’t remember comparing themselves to other classmates at school, and hoping that they would earn more in later life? Those people we call ‘weird’ are in most cases those people who for some reason don’t desire what society encourages us to desire e.g. money. We could even go so far as to question what freedom is, for usually we talk of freedom within nature. But is not nature the biggest prison of all? Kant argued that space, time and causality are categories used by the human mind to interpret experience, and so in this sense physics and biology themselves limit what we are able to think, for they provide a finite, defined number of tools with which we may think. And if you ascribe to the Newtonian view of nature as being like a machine, or Spinoza’s view of freedom as an illusion, then we could say that even the most minute of human actions is determined.